Box Text: In 1992, Hudson Soft expanded upon the Bonk's Adventure franchise they had built by creating Air Zonk, a 2D side-scrolling "cute 'em up" shooter set in a cyberpunk-esque future. 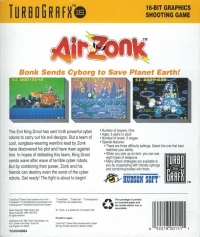 While Air Zonk differed from its successor in terms of gameplay, the cartoonish style of the Bonk series could still be seen all throughout the game, especially in the graphics, the characters, & of course, Zonk himself. 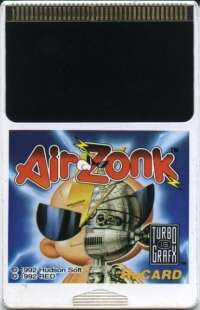 This is a list of VGCollect users who have Air Zonk in their Collection. This is a list of VGCollect users who have Air Zonk in their Sell List. 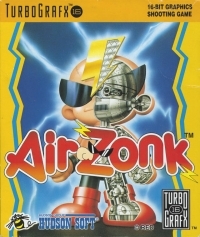 This is a list of VGCollect users who have Air Zonk in their Wish List.